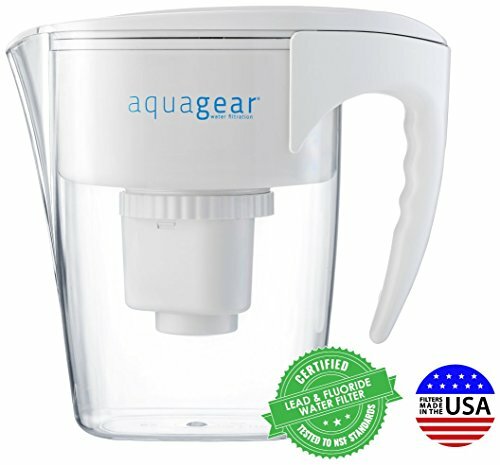 The Aquagear Water Filter Pitcher is made in the USA using only food grade materials which are 100% recyclable. The filter is very effective at removing the contaminants in your water, producing high-quality water. This is a good water filter, made with sustainability and durability in mind. The filter is produced in the USA, and it’s made out of 100% BPA-free plastic. All the materials used for this filter are 100% approved by the FDA, and 100% recyclable. One of the advantages of using this model is that its filters are more durable than those produced by the competition. The filters used by this model can last three or four times longer than others. Another advantage is that the filters are very effective at removing contaminants. These contaminants include but are not limited to chlorine, fluoride, mercury, chromium, and chloramines. This filter is capable of removing the contaminants in your water while maintaining the healthy minerals like calcium and magnesium for a better tasting and healthier water. All the filters used by this models are recyclable. Once the filter needs to be changed, you can contact the manufacturer to send a Return Shipping Label. You can use this label to send back the filter for recycling. The filter cartridges used by this water pitcher filter are very efficient. They are NSF-approved, and they actually surpass the minimum limit imposed by the NSF by some margin. The filters are tested and certified to reduce the copper and lead that might be floating in your water source. The cartridge filter uses three filter mediums to remove the contaminants in the water, each of them with a great filtering capacity. The filters can block and remove a lot of different contaminants from the water. These contaminants include but are not limited to chromium, chlorine, chloramines, fluoride, lead, mercury, and more. The smallest filter layer in the cartridge has 2-micron pores. All the particles larger than 2 microns will be removed from your drinking water. This is a great way to filter out the contaminants in your water, and it’s usually achieved only by reverse osmosis or whole house water filters. Unlike other water filters, this one is capable of maintaining the good minerals in the water. The calcium and magnesium compounds won’t be blocked by the filter, so you will have a higher mineral intake. The cartridge filter used by this water filter pitcher has the capacity of filtering up to 150 gallons of water. This means that a single cartridge filter will last for about 2 – 3 months, depending on your water consumption. Once the filter is used and you have to change it, the manufacturer will help you recycle it. You will only need to send an email to the company requesting a return shipment label and they will ensure that the filter is recycled properly. This pitcher has a capacity of 8 cups or 0.5 gallons. This is not a very large pitcher, so most people will have to refill it once or twice every day. The pitcher will fill faster when the filter cartridge is new, but after a month of use, it will take about 2 -3 hours to filter this volume of water. One of the great things about this pitcher is that it comes with a lifetime warranty. If the pitcher presents any defects, or it breaks without obvious reasons (you dropped from the second floor), you will get a free replacement. Durable Build And Filters – The unit itself and the water filters are built to last, so you will be able to use them for a longer time. Effective Against Fluoride – This is one of the most effective water pitcher filters when it comes to blocking fluoride. This model is capable of removing up to 90% of the fluoride in your water source. Slow Filling Time – The filter starts with a slow filling time which only gets slower as the filters are used. Small Pitcher – The pitcher has a maximum capacity of 0.5 gallons. This is a small capacity, and it should be increased to be more effective, especially that the filling time is slow. No Filter Change Reminder – This model doesn’t use any kind of feature to remind you when it’s time to change the filters. You should remember to mark the date you install a new filter if you want to keep track on when to change them.